A black, acid volcanic glass with a well-developed conchoidal fracture, obsidian forms by the rapid cooling of an acid lava and is often found with grey pumice. The fragments of the rock are sharp and have been used as cutting implements. unloving thoughts. It may facilitates the release of old loves and provides support during change. 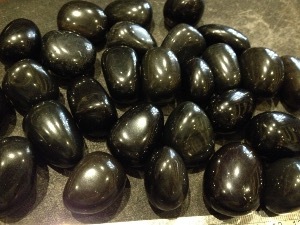 Black Obsidian tumbled to a smooth finish, an ideal pocket size stone, small enough to carry around with you. Tumble Stones can also be placed around the home for their energies or can just be nice decorative items. 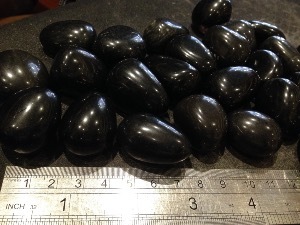 Black Obsidian crystal gemstones of varying sizes selected specially for your order.